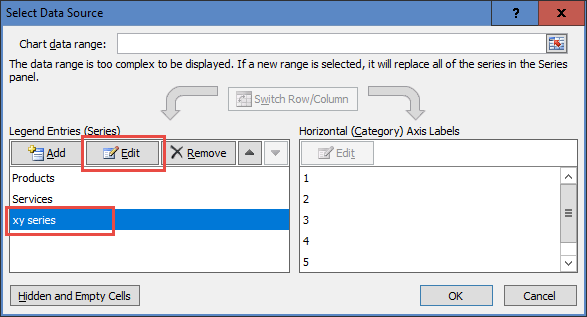 It is not too difficult, but there is a trick to understanding how Excel plots columns in an Excel Stacked Column Chart or an Excel Clustered Column Chart. 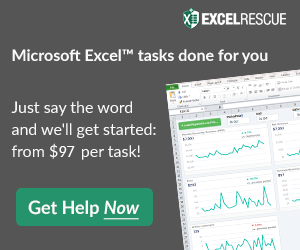 Once you understand how to add a Vertical Line Between Columns, your Excel Skills will rise dramatically. 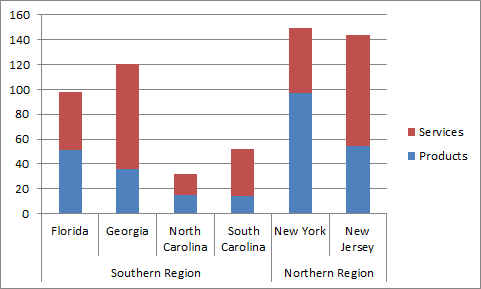 In order to create the vertical line, we need to create data to be used in an XY Scatter Chart. 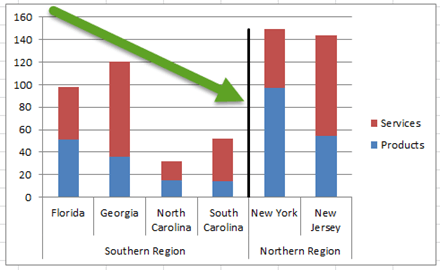 To do this, simply create a new data range for the vertical line. 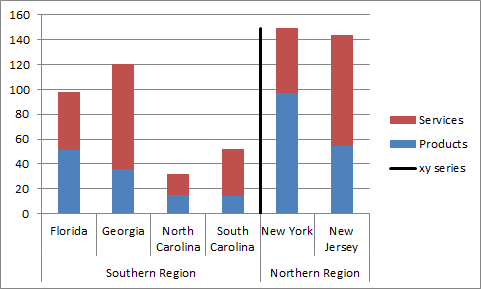 In this tutorial, we want to place the vertical line between the 2 regions (i.e Between South Carolina and New York). So we need to setup the following XY series data in these cells. 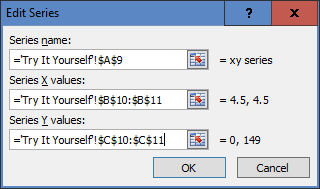 The X data values will place the line between the 4th and 5th columns. Excel treats each column in increments of 1. 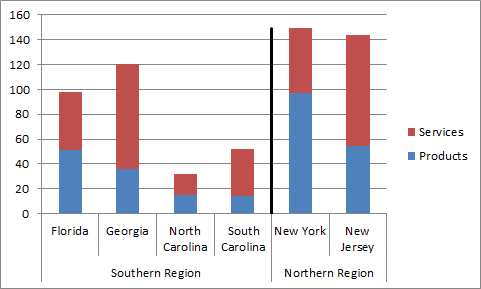 So since we want to put the vertical line between South Carolina and New York, this would be a value of 4.5 for each of the X points. The line will start at the horizontal axis, so we will need to enter a value of 0 for one of the Y values. 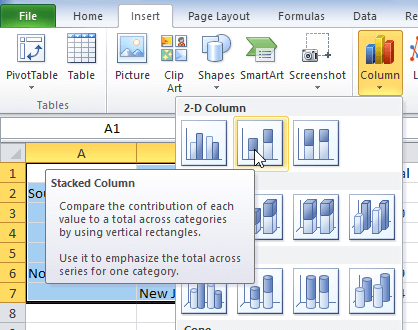 The second value should be equal to the maximum of the total of the largest values of the stacked columns. In this case, you can enter a formula of =MAX(E2:E7) in cell C11. 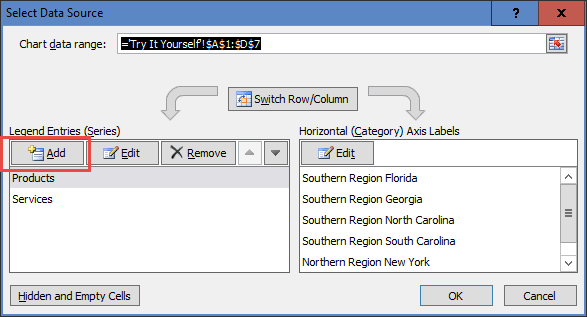 The resulting value will add a line at the top of the largest stacked column. 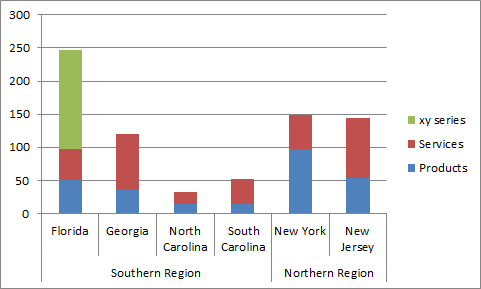 Now we can add the additional series to the chart that will be used for the Vertical Line Between Columns. 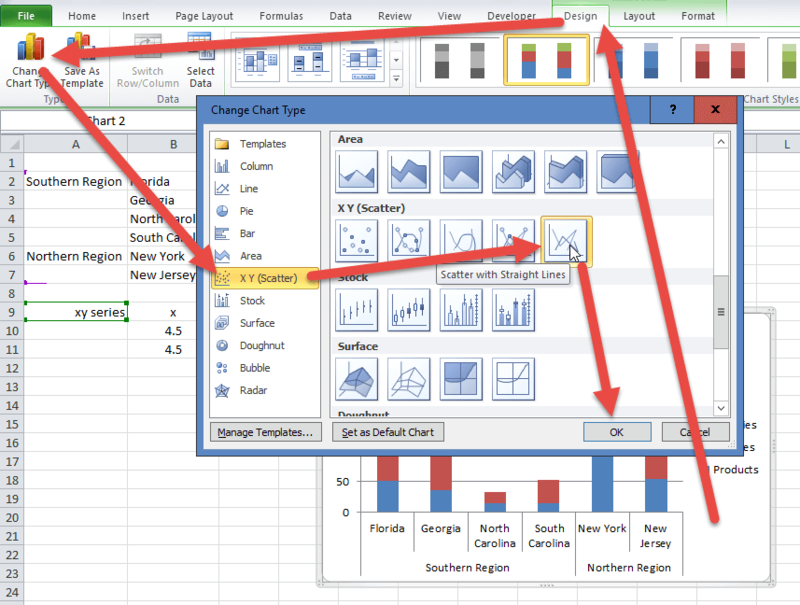 In order to do that, first select the chart, then click on the Select Data button. Don’t worry that you cannot see the XY Series, it will be visible and in the right position on the next step. This is a simple technique that is an Excel combined chart of a Stacked Column with an XY Scatter with Straight Lines. If you get this trick down, you will always be able to plot what you need as well as understand how Excel plots data on a Column or Line chart as each Legend Entry on the horizontal axis has a value of 1 starting from the leftmost value and adding across. 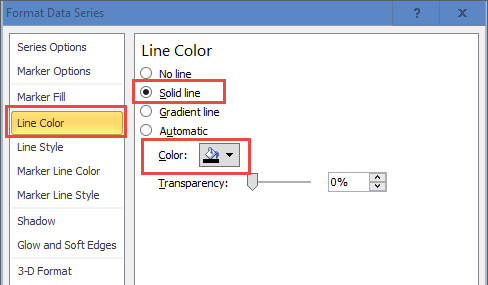 Let me know if you will now use this tip instead of drawing shapes in the chart or if you think just drawing a straight line shape on top of the chart is easier in the comments below.